Thomas Murray and his company played "The Voodoo" to a fair house at the Lansing last night. "The Voodoo," like all farce comedy, is an exaggeration, the only difference is that it is a little less clever and a little more loud than most of them. More than that "Voodoo" wit is a little stale. In wit and women we can pardon every sin but age. Reigning comedies like reigning belles may be as shallow, as frivolous, as wicked even, as they please, but wrinkles and gray hair are forbidden them. The world not only wants to laugh, but it wants to laugh at something that it has not laughed at in its youth. There is no possible excuse for a comedy farce being stale. Tragedies must be more or less so, for there is only a limited number of ways of killing men after all. Dramas are apt to be, for love is pretty much the same the world over. Operas are sure to be, for there are only a certain number of tones and combinations of tones in music. But farce comedy deals with the follies and wickedness of all creation, and these are without number and are always fresh and inspiring. The assortment of nonsense and wickedness in the booth of his satanic majesty is so large and varied that there is no excuse for a playwright selecting naughty jokes that have been used and returned to the second-hand counter. "The Voodoo" is pretty rank, but it is not so bad as its bills. Thomas Murray is a good comedian, he can laugh himself and he can make other people laugh. He is an artist in his line, though his line is not a very aspiring one. Miss Ada Bothner is still the mirthful soubrette who made such an effective Teddy in Hoyt's "Bunch of Keys," but time has by no means passed her by, and she is not so young or so pretty as she once was. One could enjoy her acting, nevertheless, for she seemed to enjoy it herself. The great fault with the play is that from beginning to end it is "the same thing over again." Last night, for the third time since her return from her studios at Boston, Miss Daisy Tuttie appeared in a vocal recital in the Y. M. C. A. hall, giving unmistakable pleasure to an audience of nearly 200 people. In many respects this was the most satisfactory of all her public appearances in Lincoln. A few mannerisms noticed at her last concert, due largely to nervousness and fatigue, were absent. She had complete command of herself and sang with confidence, accuracy, precision. The qualities of her voice which have been so generally admired came out to excellent advantage under these favorable conditions, and her tones, especially in the upper register, had a clearness and resonance that reminded one of a triumphant trumpet call. Her greatest fault of last night was a lack of shading, due, no doubt, to a high enthusiasm and the strength to keep up to its demands through the entire program. A trifling defect, and one easily remedied, is the habit of eating time with the sheets of music, which sometimes gives an erroneous impression that the singer and the accompanist are not in perfect sympathy. Miss Tuttie was received with warmth and rewarded for her songs with applause, flowers and unstinted compliments. Her greatest success was Adams' "Mona," after which she was recalled to sing the "Maid of Dundee." Schubert's serenade was less effective than it would have been with a string accompaniment, more suited to Schubert's style. The jewel song from Faust was done with a spirit and a voice that rose to the needs of this rather ambitious piece. Miss Tuttie was assisted by Dr. E. H. Eddy , who sang De Koven's "Spanish Serenade" in good voice and with fine effect; by Mr. Eddie Walt , who played two violin numbers, Singelee's "Fantasie Pastorale" and Rubenstein's "Melodie in F," and by Miss Gertrude Culberston , whose rendtion of Chopin's scherzo was a brilliant performance and whose accomplishments were played with good taste and accuracy, throughout. Thomas Murray: Comedian Thomas E. Murray. British critic William Archer described Murray as an "American music-hall comedian" whose "patter, however, is good-humoured, and for the most part inoffensive, and he shows some dexterity in his business and dancing" (The Theatrical World 111). He appeared in The Voodoo (1891), On the March (1896), and Our Irish Visitors (1899). Thomas Murray company: An advertisement for The Voodoo, on tour in Chicago in December 1892 called Thomas E. Murray's company a "Rattling Rapid Company." Apart from Murray and Ada Bothner, the members are unknown. Ada Bothner: Actress Ada Bothner was born in England and came to the U.S. about 1890, appearing first in comic opera. She joined Charles Hoyt's company and appeared in the original cast of The Voodoo. She toured as Teddy Keys in A Bunch of Keys until shortly before her death from spinal meningitis in May 1899. Teddy: A character, Theodosia (Teddy) Keys in Charles Hoyt's A Bunch of Keys (1883). Bunch of Keys: Hoyt's first play, A Bunch of Keys: Polished Up to Date, opened in New York in 1883. A man leaves a hotel to one of his nieces—Rose, May, or Theodosia Keys—whichever niece is declared to be the homeliest by the first traveling salesman who comes to the hotel. Miss Daisy Tuttie: There were several Tuttle families in Lincoln in 1894, but a Daisy Tuttle is not listed. She may have been a daughter of attorney Samuel J. Tuttle, living at 3012 O St., or a younger sister of university students Mabel, Elizabeth (Bessie), and Emma Tuttle, daughters of S.P. and Sarah E. Tuttle, who lived at 520 s. 13th St in 1893 and 533 N. 27th St. in 1894, according to the Lincoln city directories. the Y. M. C. A. hall: The Young Men's Christian Association of Lincoln was founded in 1880 as a means of giving recreational, social, and spiritual opportunities for men. 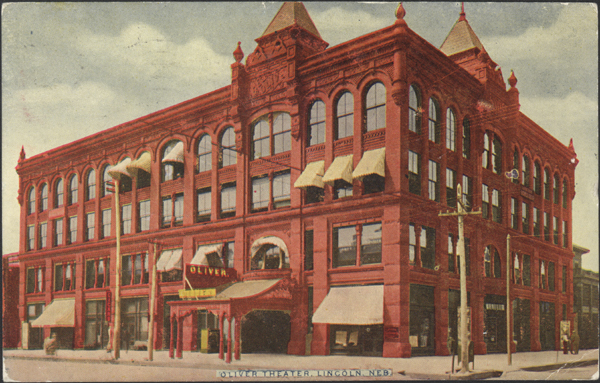 Their building on the southwest corner of 13th and N Streets was completed in 1890. Adams: Stephen Adams was the pseudonym of Michael Maybrick (1844-1913), composer of sentimental, popular, and religious songs; his best-known is "The Holy City", with words by his long-time lyricist Frederick E. Featherley. Maybrick was born in Liverpool, a musical child prodigy: he became a church organist at fourteen and a composer of anthems at fifteen. He studied music in Germany and became a singer in opera and in concerts. One of his first popular songs was "Nancy Lee" (1878); many others followed, making him one of the most popular British composers of the late nineteenth century. "Mona": A song by British composer StephenAdams; the words, by Frederick E. Featherley, are as follows:O swift goes my boat like a bird an the billow,The boat of my heart-my trim Ben-my-Chree;But swifter than bird leaps my love from her pillow,The girl of my heart, who is waiting for me;And down drops the anchor, the brown sails are falling,And out on the shingle we leap in our glee:But for all the bright eyes and the laughter and calling,The girl of my heart is all that I see. Mona, my own love; Mona, my true love,Art thou not mine thro' the long years to be?By the bright stars above thee, I love thee, I love thee,Live for thee, die for thee, only for thee,Oh, Mona, Mona, my own love,Art thou not mine thro' the long years to be? "Maid of Dundee": Also known as "Bonnie Sweet Bessie, the Maid of Dundee," this popular song by James L. Gilbert had been published by 1873. It begins, "A highland laddie there lived o'er the way". Serenade: Probably the song beginning "Leise flehen meine Lieder durch die Nacht zu di," (from a poem by Ludwig Rellstab), number 4 from the Schwanengesang D. 957; it is one of Schubert's most popular songs. Schubert: Franz Schubert (1797-1828) was born in Vienna, the son of a poor schoolmaster. He early showed aptitude for the piano, violin, singing, and composition; through the influence of Salieri, he was able to attend the Imperial and Royal City College in Vienna, where he received one of the best educations available to a non-aristocrat, and met many of the friends who helped sustain him in later life. He was a prolific composer with a particular genius for song, raising the German lied to an art form, though his symphonies, chamber music and piano music are equally celebrated. The jewel song from Faust: In the third act of Gounod's opera, Faust, Marguerite comes into her garden and finds the casket of jewels which Faust and Mephistopheles have left for her. She puts on the jewels and sings this famous aria.In Book 2 of O Pioneers! Marie Shabata hears Emil Bergson whistle this air as he cuts grass in the Norwegian graveyard. Dr. E. H. Eddy: Everett Henry Eddy, born about1863 in Illinois, took a Bachelor of Law degree from the University of Nebraskain 1887. By 1893-94 he was a medical doctor living at 435 N. 25th St.;in 1900 he and his family were living in Grand Rapids, Michigan; theuniversity's 1936 Alumni Directory shows he and his brother Hamlin Clark ('85)were living in Moose Jaw, Canada. De Koven: Reginald de Koven (1859-1920) was born in the USA, but educated in England, then went to Europe to study music before returning to the US in 1882 to go into business in Chicago. His successful real estate and commercial ventures enabled him to return to his first love, music. He is best known as the composer of romantic operettas, most notably Robin Hood (1890), which contains his most popular song, "Oh Promise Me," which quickly became a favorite at weddings. "Spanish Serenade": This composition by Reginald de Koven may come from one of his early operettas, possibly Don Quixote (1889). 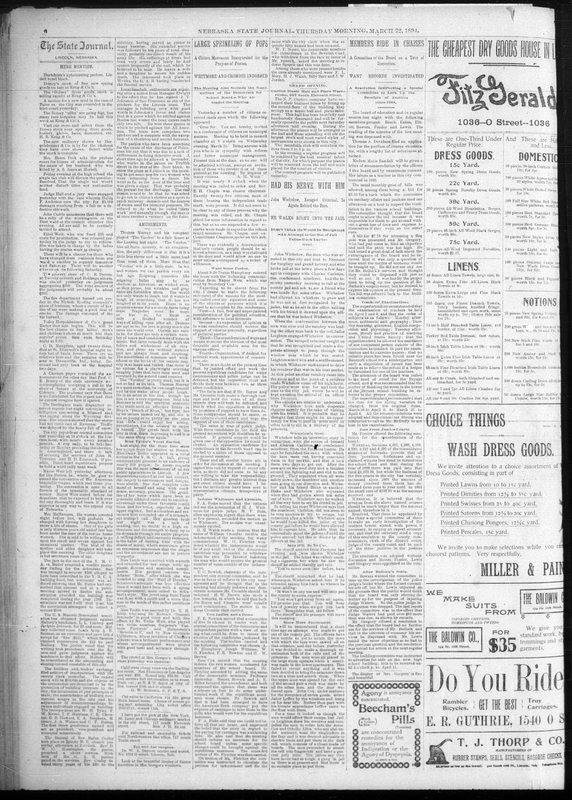 Mr. Eddie Walt: Edward J. Walt (1877-1951) was a clerk for the N. P. Curtice Co. in 1893-94, and lived at 1322 E St., according to the city directories. Jean-Baptiste Singelée: Jean-Baptiste Singelée (1812-1876) was a Belgium-born violinist and composer of many fantasies for violin and saxophone—he was a friend of Sax and his compositions did much to popularize the new instrument. Fantasie Pastorale: Jean-Baptiste Singelée's "Fantasie pastorale"(op. 56) for violin, popular with amateur musicians, has also been arranged forsaxophone. Rubenstein: Russian virtuoso pianist and composer Anton Rubinstein (1829-1894) was born into a large Jewish family which converted en masse to the Russian Orthodox church, a move which removed many of the restrictions placed on Jews in Czarist Russia. His mother was his first piano teacher, and he was early recognized as a prodigy, giving his first public performance in Moscow when he was nine. He was taken to Paris, where he played for Chopin and Liszt, then toured Europe and western Russia. He studied composition in Germany, where Mendelssohn and Meyerbeer encouraged his talents. However, in his late teens he was reduced to poverty, giving piano lessons while he continued to compose. He returned to Russia in 1848, establishing himself in the musical life of St. Petersburg before setting out on a concert tour in 1854 that established him as a pianist, the rival of Liszt as a virtuoso. With the aid of the Grand Duchess Elena Pavlovna, he established the first music school in Russia, the St. Petersburg Conservatory, in 1862, serving as its director. The Steinway piano company sponsored an American tour in 1872-73, wherein he played 215 concerts in 239 days—an experience he vowed not to repeat; the money, however, gave him financial security. "Melodie in F": The Melody in F (op. 3, no. 1) for solo piano is probably the most famous and lastingly popular of Rubenstein's compositions. It was published in Vienna in 1852, and has often been transcribed for voices and for other instruments. Miss Gertrude Culberston: Gertrude Culbertson is listed in the 1894 Lincoln city directory as a music teacher, living at 2547 T St.; she was probably the daughter of Griffith J. Culbertson and his wife Lydia (Peeper) Culbertson, who had lived at that address in 1890. The 1880 census for South Macon, IL, shows that Griffith and Lydia Culbertson had a six-year-old daughter, Hannah G. Culbertson, who may be the same person. Chopin's scherzo: One of Chopin's four independent compositions with that name: the first Scherzo, in B minor (1835); the second, in D-flat (1837); the third (and most likely, since it is considered one of his greatest) in C-sharp minor (1839); or the fourth, in E (1842). Chopin: Frédéric Chopin (1810-1849), born in Poland, was a child prodigy on the piano and as a composer. After his musical education in Poland, he went to Paris in 1831, where he established himself as a pianist playing his own compositions, and then as a teacher, performing in public less and less. His affair with George Sand (which she depicted in the autobiographical Lucrezia Floriani) began in 1838, but his health—he was diagnosed with consumption—began to deteriorate. However, many of his greatest works were composed in summers at her home in Nohant over most of the next nine years. scherzo: A scherzo (a term deriving from a German word meaning "joke") often forms one of the movements of a sonata or other larger composition; it is rapid in pace and often comic or ironic in tone.